could not have been more perfect if it were concocted by a studio press agent. Born in tiny Smithton, Pa. (pop. 877), only daughter of the Jones Family (brewers of popular “Stoney’s Beer”) the feisty and precocious Shirley Mae was an early community handful, but showed signs of a particularly mellow vocal range, and that was the beginning. 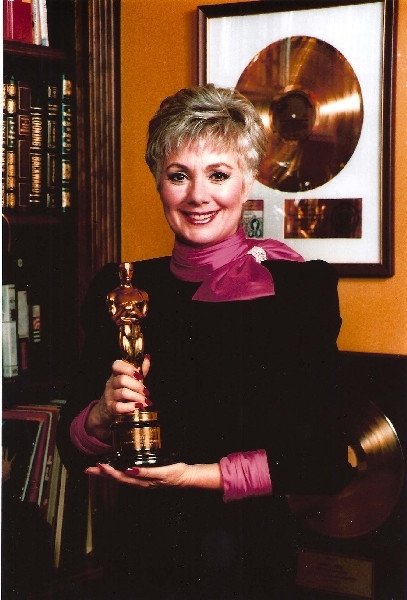 Her church, her teachers, and her parents were all savvy enough to see the way and Shirley’s local music lessons opened the door to summers at the Pittsburgh Playhouse; and the Shirley Jones Story was underway. Someone suggested that 18-year-old Shirley Mae sign up for the “Miss Pittsburgh” competition. It was not Shirley’s #1 passion, but she went along, and took the crown. It was 1952. Here, we can say, the plot thickens some, because through all this conspicuous show business calling, Shirley Jones alerts the world around her that she has decided to be a veterinarian. And so, with all other bets off, she is enrolled in New Jersey Centenary College and prepares for the journey east…with a one-week vacation stopover in New Your (cue trumpets–Providence was back at work). With her week (and her money) spent, she gets a call from a friend who tells her that the Rodgers & Hammerstein show South Pacific, currently on Broadway, will be having open auditions to replace two parting chorus members. And Shirley takes that fateful bus ride downtown to the St. James Theater and the line of umpteen showbiz hopefuls, where the stage has been meticulously set to deliver Smithton’s Shirley Mae Jones not to a veterinary college but to the “Time and Place” of her remarkable million-to-one public destiny. Shirley got to the front of the line and sang her song, “The Best Things in Life are Free.” “Please wait”, the man said – and another line and another trip out front to sing. Finally, almost exhausted, the line whittled down to a handful, a fourth performance, and a voice from the back of the darkened theater –“Thank you Miss Jones, for being here so long. If you don’t mind, I’d like to call my partner, Mr. Hammerstein, and ask that he come down and hear you.” “Oh, sure,” the always gracious Shirley says, “And what is YOUR name?” (Words that Mr. Richard Rodgers will never forget, we daresay). From Carousel, The Music Man, April Love, an Oscar for her role as Lulu Baines, (the prostitute opposite Burt Lancaster in Elmer Gantry), to the harried head of The Partridge Family; movie, television and stage roles, a record breaking Broadway run, two recent Emmy nominations, and an ongoing career of SRO Symphony Concerts and speaking engagements world wide; to be sure an incandescent place in the hearts of all America that doesn’t ever seem to go away. And so… we suppose, the only question left in the Glorious Shirley Jones American Icon Story is – Did anybody ever call Centenary College to tell them Shirley isn’t coming?